Below are another two teasers for CD2, both from Udi Harpaz' 2nd Season episodes. 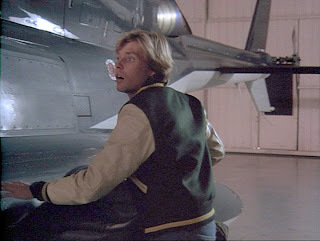 The ‘SEVERANCE PAY’ theme is a medley of two scenes, the first were Archangel, Larry Mason and Marella are in the Lear jet going up against the P-51 Mustang fighter, and the other [this MP3 teaser] were Larry and Hawke are trying to escape in Larry's souped-up van with Henderson from the Firm on his tail. 'NATURAL BORN' is were Kevin wakes up inside Santini Air to find that Hawke has just flown Airwolf secretly into the main hangar at night [this MP3 teaser]. He naturally can't believe his eyes and this mystical little theme from Udi Harpaz plays during that scene. The rest of the track is made from a melodic medley of Kevin's aerial pursuits against Blue Stone Aviation's UH-1J Huey gunship. I'm up at Einstein Studios four nights in a row next week (Mon - Thur) which are four evening slots that came out of the blue so that'll enable another few tracks to be mastered plus some more tweaks to this first go at 'NATURAL BORN'. It's just down to when the chief engineer at Einstein can fit me in at night (after I leave work) at the moment as he's fully booked 3 months ahead with bands, so he's doing me a huge favour trying to find slots for it. The toys that we've access to now are fantastic over a decade on. I've found that the original keyboards (my two Yamaha SY77's, Roland XP30 etc.) have been used a lot less than the first time, as the noiseless wonder of the modern 24-bit Pro Tools world of software synths (with no constraints any more) and software samples within the digital environment is just a joy to behold. Different era. The original AWT was pure analogue in every way, and was recorded on Ampex 24-track tape back in 1998. Digital (in its current form) was only starting out then in the late 1990s, but in the late Noughties it really matured. Jan has recently updated his part of the Airwolf Extended Themes pre-production Tracklist, so be sure to drop in on it regularly for progress either on his Orchestrator's blog or on the complete 2CD Tracklist here. There are certain things of course that no amount of digital wizardry can match (yet), so certain acoustic guitar parts (like in "CROSSOVER" and others) and of course the cello solo from "EAGLE's/HAWKE's THEME" and 'PROOF THROUGH THE NIGHT') just can't match the real thing... real people are doing those for me, plus electric guitar when "power chords" are required on Udi Harpaz' tracks especially. 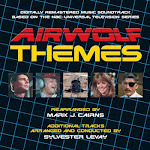 Would have been nice to have the 80-piece Munich Philharmonic Orchestra (who did the original AWT CD2 with Sly) at my beckon-call every day for 6 months but with around 35-36 brand new Airwolf tracks that would mean every copy of AET 2CD would cost about $5000 bucks a pop! (what's new, I hear you say. Hahaha. Ha.). However the LA Scoring Strings and Vienna Symphony Libraries [from here on in called the "Einstein Orchestra" ;D] are just wonderful and the true state-of-the-art (when mixed with top studio production kit of course) and I think and hope will surprise many but the biggest orchestra snobs out there... certainly surprised me and I'm very happy with the tracks that require orchestral parts thus far. They'll be as good as we can possibly make them. "Mastering" is all about getting the levels of the recorded instrument tracks correct and sitting well together and sounding as best possible on as many different audio set-ups as possible (from an iPod to a high-end audiophile's system); it's always a balance between them all. It's also the time when other audio engineering processes are applied to each individual instrument in the track, such as Reverbs, Volume Level Automation along the timeline, Compressors, Limiters and other sonic wonders. I'm doing all the pure synth tracks first so we can get a "level" of where they sit best in the mixes; then gradually do the synth/orchestrals and then the pure orchestral stuff at the end; and in that order. That's why the first five MP3 teasers out so far are all of the same ilk. If I can get at least one track mastered and signed off every night I'm up at Einstein then happy days. I then take the track away and listen to it in my car and on various audio systems to hear how the mix sounds, whether it's too bass-heavy or if levels in other instruments aren't correct, we tweak them for an hour the next night I'm back in. That's the joy of using the purely digital world of ProTools this time compared to setting up the mixing desk and recording from an analog 24-track Ampex tape onto DAT tape with the original Airwolf Themes. We nowadays work natively in ProTools in 24-bit; which of course in the end has to be down-sampled to 16-bit for CD. For the record, my ears can't really hear the difference. Maybe some audiophiles out there think they can hear a difference (or have ten$ of thou$ands of dollars worth of top-end 'valve' audio kit and can) but I can't in the real world. That's the status quo at the moment. It will be done when it's done.